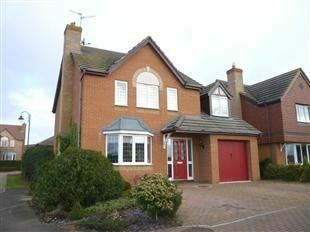 Four bedroom detached house situated in Hampon Hargate. Accommodation consists of entrance hall, cloakroom, lounge, dining room, kitchen/breakfast room, utility room, four bedrooms, en-suite to master, family bathroom, single garage, off road parking, front and rear gardens. Window to side, understairs cupboard, laminate flooring, radiator, telephone point and stairs to first floor. Double glazed bay window to front, feature fireplace with wooden surround and gas fire, wall lights, radiator, TV and telephone points and double doors to dining room. Double glazed window to rear, radiator, TV and telephone points, fitted carpet and door to kitchen/breakfast room. Fitted with a range of matching wall and base units with work surfaces over, part tiled walls, stainless steel sink/drainer, integrated electric fan assisted double oven and gas hob with extractor fan over, plumbing for dishwasher, radiator, TV and telephone points, larder and double glazed window to rear and door to utility room. Fitted with matching base units with work surfaces over, part tiled walls, stainless steel sink/drainer, plumbing for washing machine, radiator, door to side and door to garage. Fitted with low level WC and wash hand basin with tiled splashbacks, radiator and extractor fan. Airing cupboard housing hot water tank, loft access and radiator. Two double glazed windows to front, two built-in double wardrobes, radiator, TV point, fitted carpet and access to en-suite. Fitted with low level WC, wash hand basin and shower cubicle, part tiled walls, extractor fan, shaver point, radiator and frosted window to front. Double glazed window to rear, built-in wardrobes, radiator, TV and telephone points and door to family bathroom. Double glazed window to rear, built-in wardrobes, radiator, TV point and fitted carpet. Double glazed window to front, built-in wardrobes, radiator, TV point and fitted carpet. Fitted with panelled bath with shower over, low level WC and wash hand basin, part tiled walls, radiator and frosted window to rear. The front garden is laid to lawn with block paved driveway providing off road parking for 4 cars leading to a single garage with up and over door, power and light connected. The rear garden is fully enclosed and is laid to lawn with patio area, shrubs and gated side access.